A soothing water features invites you to enter through the hall with a staircase finished off with a delicate wrought iron balustrade and chandelier, flowing through to the open plan dining-room with French doors opening to a peaceful patio and lush garden. Compact kitchen with granite tops, gas and electric cooker. Pantry cupboards and separate scullery with place for 3 appliances. Formal lounge with wooden floors and gas fireplace. A cosy TV lounge with built in bar, leading out to an undercover patio and private pool. Upstairs boast a main ensuite bedroom with a walk-in dressing room and private balcony. Two additional bedrooms and a full second bathroom. A compact fitted study with own balcony. Double automated garages fitted with BIC and access into the home. Staff accommodation/ flatlet consists of a small lounge, bedroom and bathroom. Extras include fitted alarms system with radio link to ADT, burglar bars, underfloor heating. Sold with major appliance, beds and some furniture. Secure 24hr guarded, child and pet friendly estate. Centrally situated to all the best schools and shopping centres in Bryanston. 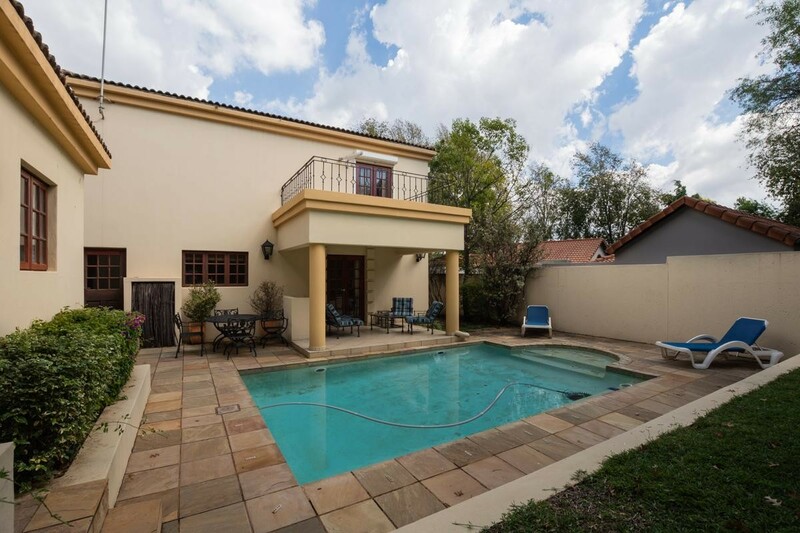 Walking distance to Bryanston Country Club.